Sloped roofs guard against heat and rain. EcoPro underlayment serves as an alternative to traditional timber bases, providing a weather barrier in case of water penetration through the roofing or flashings. SAHYADRI Industries Limited (SIL), a leading Indian manufacturer of cellulose-based cement board, says its non-asbestos cement fibre board can be used as a roof underlay to increase the thermal performance of houses while protecting them against the elements. Called EcoPro, these boards have a good K value, an aesthetic appearance in addition to offering good performance and impact resistance. M Satyanarayana, president of SIL, points out that sloped roofs have traditionally been associated with cement or metal roof system used by the common man. “But those days have gone … the latest designs and advancement in sloped roofs not only ensures that these structures protect you from heat and rain but also enhance the aesthetics of any home, villa or commercial complex,” he says. 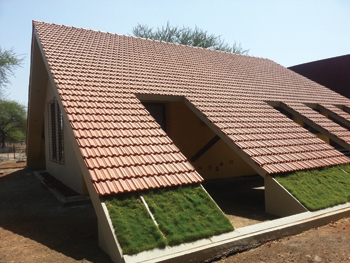 Satyanarayana says that EcoPro can be used as an alternative for the timber base used for shingles or roof tiles. He further explains that as shingles or tiles are the primary protection against the exterior environment on a roof installation, EcoPro used as an underlay plays a critical role by providing a secondary level of protection against heat and water penetration. The board works as a crucial barrier that contributes to the performance and longevity of the entire roof system. • Assists in providing UL (Underwriters Laboratories) fire rating (since shingles are usually tested with underlayment). The roof deck should be sound and level before installing the Ecopro underlayment, Satyanarayana adds. EcoPro boards are made of cement and cellulose fibre with a blend of additives to produce a homogenous material using a unique autoclaving high-pressure steam curing technology which provides high strength to these boards. They have a superior finish with high impact resistance and are available in thicknesses ranging from 6 mm to 18 mm with a face and rear side finish. Catering to the changing needs of the construction industry, EcoPro has been developed with a focus on quality and improved aesthetics. 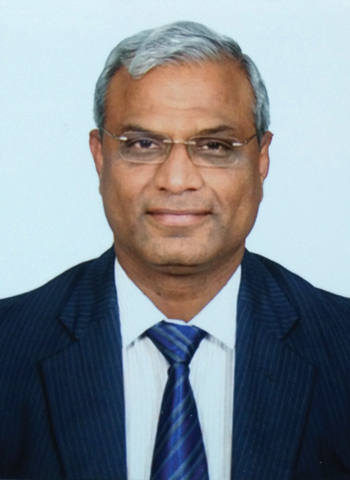 It meets various international standards, making it an innovative product that aims to revolutionise the building materials industry and offer sustainable solutions to the sector, according to Satyanarayana, who is eyeing the Gulf market for SIL’s products. “This promising board provides an answer to the world’s infrastructure problems that are posing new challenges and demanding convincing solutions,” he claims. EcoPro boards are useful for dry-wall, false ceilings, roof underlays, furniture, façades and many other applications. Armed with a diverse product portfolio, SIL offers new technologies for metropolitan, urban and rural spaces not only in India but also in South Asian, Middle East, Gulf and African countries. It provides innovative and future-focused products for roofing; interior and exterior building products; security-enabled main doors; pre-engineered/hybrid building solutions; and non-conventional energy solutions. SIL’s initiative with renewable green power generation has been one of the most acclaimed in the field of energy technology. It has set up 31 windmills in different parts of India, such as Maharashtra, Rajasthan and Tamil Nadu to generate a total output capacity of 23.2 MW. Promoters’ investment in 17 windmills has added 13.6 MW, while another 17 more windmills of 13.6 MW capacity have been set up in partnerships. Wind World (India) (former Enercon India) has provided technological support in the form of supply, installation and commissioning of these machines. A socially active and responsible company, SIL continuously works towards the development of society. By providing shelter to rural areas over the past three decades, SIL says it has helped millions upgrade from thatched roofs to more durable solutions. Prefabricated units have also been developed for small to large-scale industries, poultries and cattle sheds railways, bus terminal and cottages to promote better working conditions.